June saw the launch of Vivek Singh’s latest cookbook, Indian Festival Feasts! In celebration of this, for the June recipe we’re sharing an ultimate celebration dish. 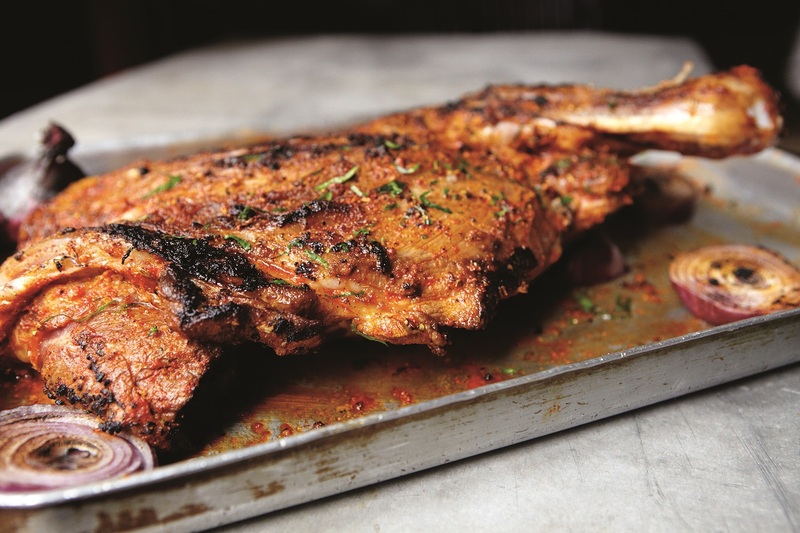 Raan; whole braised leg of lamb with peppercorn and nutmeg is a real centrepiece! It’s also very simple as far as the number of ingredients go, making it an absolute must-try. It’s traditional to use leg of lamb, but the dish tastes just as good if you use shoulder. Remove the surface fat from the leg or shoulder of lamb and prick the leg thoroughly using the tip of a sharp knife or a trussing needle (you can ask your butcher to do this for you, if you wish). Mix all the marinade ingredients together into a paste. Spread the paste all over the lamb and massage the spices in. Set aside to marinate for at least 30 minutes, or preferably for a few hours in the fridge. Scatter the whole spices in a deep baking tray large enough to accommodate the leg, then place the marinated lamb on top. Pour over enough water to come three-quarters of the way up the lamb. Cover with foil and cook in the preheated oven for 2½–3 hours until the meat is soft and easily comes off the bone. Remove from the oven and let the leg cool, then drain and reserve the cooking liquor. Once cool, make deep incisions into the leg and remove the meat from the bone. Cut the meat into 1cm thick slices and arrange on an ovenproof serving platter. Brush with the butter and heat in a warm oven; hold warm until ready to serve. For the sauce, transfer the strained cooking juices to a pan, add the tomato purée and cook down slowly to a sauce consistency. Add the peppercorns, nutmeg and cream. Check the seasoning and add salt and sugar to taste. Whisk in the butter, remove from the heat and pour over the sliced raan. Sprinkle with spring onions. If using rum, pour it into a ladle and heat it until flaming, then pour over the lamb and bring to the table as the show-stopper. 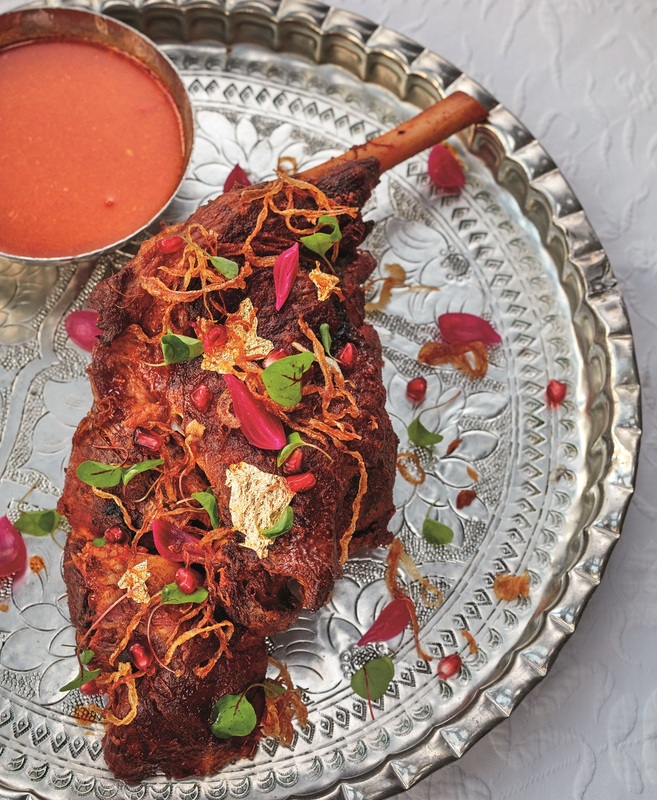 May’s dish of the month features the recipe for mutton biryani with dried fruits and Kashmiri spices, from the new cookbook Vivek Singh’s Indian Festival Feasts – out 1st June. As the month of Ramadan begins all over the world, this is a feasting dish perfect for Eid-ul-Fitr, the celebration that rounds up Ramadan. 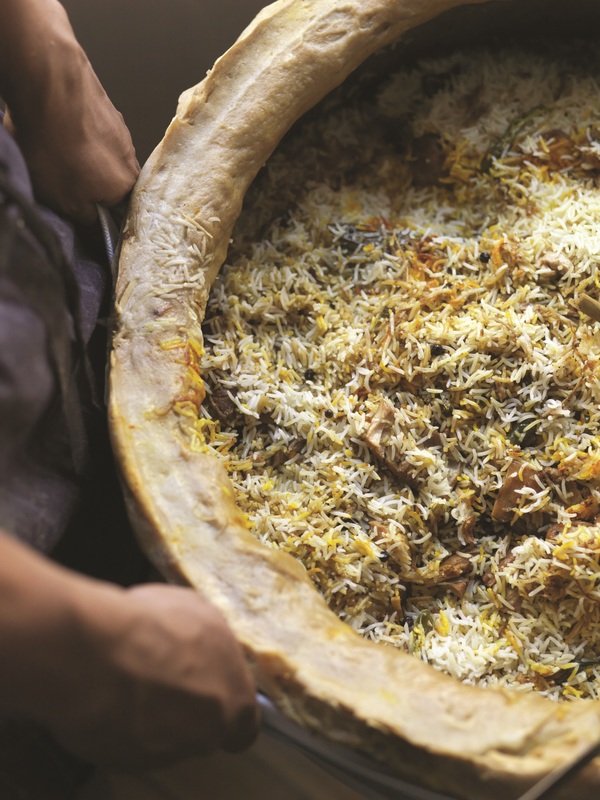 A biryani of some description is always a regulation dish at celebrations, but at Eid the Kashmiri version is often preferred as it is rich and made even more special by the use of dried fruit and nuts. Much as at all other celebrations where the dishes remain similar but the ingredients or their quality change with the status of the family, this dish is judged by both the quantity and the array of nuts and dried fruits included. As made by Vivek on BBC’s Saturday Kitchen – catch up on the show here! Mix the marinade ingredients together in a large bowl, add the meat and stir to coat. Cover and put in the fridge to marinate for 30 minutes, or if possible overnight. Meanwhile, bring 2.5 litres pints of water to the boil in a large saucepan. Add the rice, lime juice and salt and boil for 6 minutes, until the rice is two-thirds cooked. Drain the rice and spread it out on a tray to cool. Heat 120g of the ghee or vegetable oil in a wide, heavy-based casserole dish. Add the raisins and fry for 30 seconds, or until they puff up, then remove them and drain on kitchen paper. Add the walnuts and fry for 30 seconds, then remove them and drain on kitchen paper. Add the green cardamom pods, cinnamon and bay to the casserole and fry for 30–60 seconds. Add the cumin and black cardamom seeds. Add the meat and marinade and cook for 10–12 minutes over a high heat, stirring occasionally. Add the coriander, garam masala and 250ml of water and cook, covered, over a medium heat for 30 minutes, or until the meat is almost cooked and about 235ml of sauce remains in the pan. Add a little more water to make up the liquid if needed. To assemble, spread an even layer of the rice over the cooked meat and sauce, sprinkle the saffron milk, rose water, fried raisins and walnuts, figs or apricots, cranberries and mint over the rice and dot with the remaining ghee. Cover with a tightly fitting lid and cook over a medium–low heat for 12–15 minutes, turning the pan every 3–4 minutes to prevent it from catching, until the dish is hot and steaming and the rice and meat are cooked. Set aside for another 5 minutes, then open the pot and serve. Otherwise known as ‘baghare baingan’, my April recipe is one that has different versions all over India, but the most popular one is from Hyderabad. It has rich, deep, earthy notes, and some recipes use fat green chillies alongside aubergines, or even include lamb’s liver in the sauce. 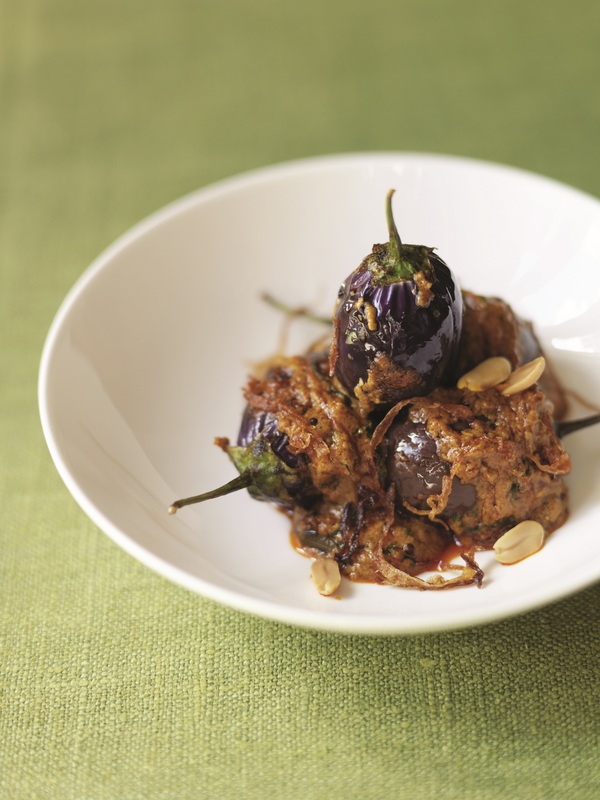 The term ‘baghare’ refers to the tempering of the aubergines. Make 2 deep slits in each aubergine, forming a cross from the base towards the stalk end but leaving the quarters attached. Leave the calyx and a little of the stalk on to hold the aubergine together. Sprinkle the aubergines with half the salt and set aside for 20 minutes. Meanwhile, make the masala paste. Separately roast the coconut, peanuts, sesame, coriander and cumin seeds in a dry frying pan over a medium heat for a minute or two, and then remove from the heat. Blitz them in a small food processor with the chillies, adding just enough water to make a paste. To cook the aubergines, heat 1 tablespoon of the oil in a large, heavy-based pan and fry them over a high heat for 2–3 minutes, stirring from time to time, until they are seared on all sides. Remove the aubergines from the pan and heat the remaining oil in it. Add the mustard seeds and curry leaves, let them crackle, then add the ginger–garlic paste and fry for 2–3 minutes, stirring constantly to prevent sticking. Add the onion paste and cook, stirring, until it turns light brown. Stir in the turmeric, red chilli powder and masala paste, reduce the heat and fry for 10–12 minutes, until the oil begins to separate from the mixture at the side of the pan. Now add the remaining salt and the tamarind paste and cook for 3–4 minutes. Return the fried aubergines to the pan and mix well. Pour in the water and simmer for 10–12 minutes, until the aubergines are soft but still hold their shape. Finish with the jaggery, chopped mint and fried onion. Serve with either naan bread or pilau rice. Tip: Don’t stir the aubergines too vigorously when simmering them in the sauce, as they break quite easily. My March recipe is a firm favourite and is perfect for entertaining lots of guests in one go. You can give this recipe a go with hogget, mutton or even goat, so long as you stick to the shoulders. With the tip of a sharp knife, cut small incisions in the lamb shoulders at approximately 5cm intervals. Mix together the red chilli powder, ginger and garlic paste, vinegar, yoghurt, fried onions, cumin seeds, coriander, rose petals and salt. Using your hands, massage the spice mixture over the shoulders, rubbing and pressing the spices into the gashes created by the knife. Set aside for 15 minutes. Arrange the sliced potato and onion on a deep oiled baking tray. Place the shoulders on top of the potato and onion slices, add the bay leaves, cinnamon and cardamom, then pour the water around the shoulders and cover the tray with foil. Place in an oven preheated to 180 degrees C and braise for 2 1/2 hours, until the meat is very tender and ready to fall off the bone. Remove the shoulders from the liquid and place on a cooling rack. Pass the liquid through a fine sieve and reserve to make the sauce. Now roast the shoulders on a barbecue or under a very hot grill, basting frequently with the melted butter, until crisp and well browned. Finish with a drizzle of lemon juice, any leftover melted butter and the chaat masala. For the sauce, bring the cooking juice to the boil in a small pan and simmer until reduced to a coating consistency. Correct the seasoning and gradually stir in the cream, garam masala and fresh coriander. Pour the sauce over the meat and serve with naan bread. Tip: It’s important to drain all the liquid from the shoulders before roasting them, in order to get a crisp finish. February’s recipe of the month is an incredibly simple, but delicious way to cook broccoli. Vivek Singh will be preparing this dish as part of the Fire and Feast Collaboration Dinner on Monday 27th May, in aid of the charity Action Against Hunger, curated by Persian and Middle Eastern Chef Sabrina Ghayour. In a bowl, rub the cheese with your fingers to break up any lumps. Add the yoghurt and mix until smooth. Add the ginger and garlic paste, salt, chopped ginger and chilli and mix well, and then stir in the cream carefully, as the mixture might separate if mixed too vigorously. Finally add the rose petals, mace, and cardamom powder, gently fold in the broccoli florets, and drizzle with a tablespoon of oil. Mix and set aside for 20 minutes. To cook the broccoli, soak 4 bamboo skewers in water for 30 minutes. 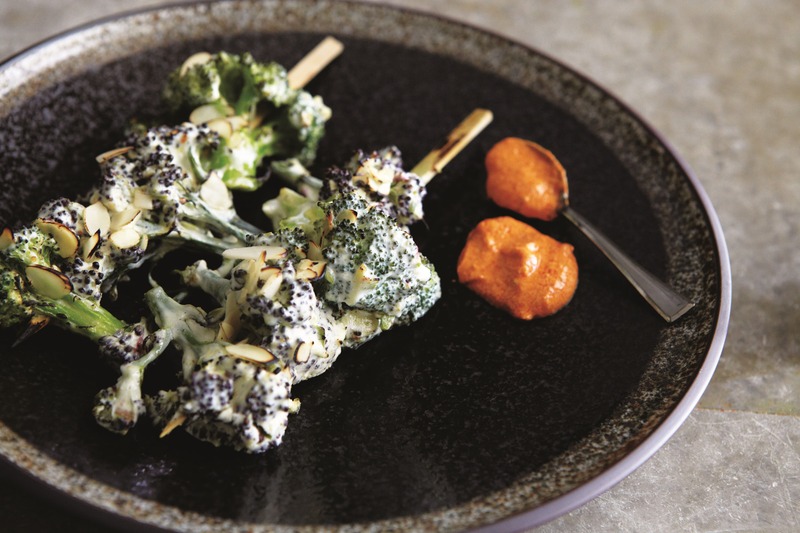 Thread the broccoli florets onto the skewers, arrange on an oiled baking tray and place under a hot grill for 5-6 minutes, until the broccoli florets are cooked and slightly charred at the edges. Now sprinkle with almond flakes and toast for another minute or so. Remove from the grill and serve immediately, squeezing over the lemon and accompanying with chutney of your choice. 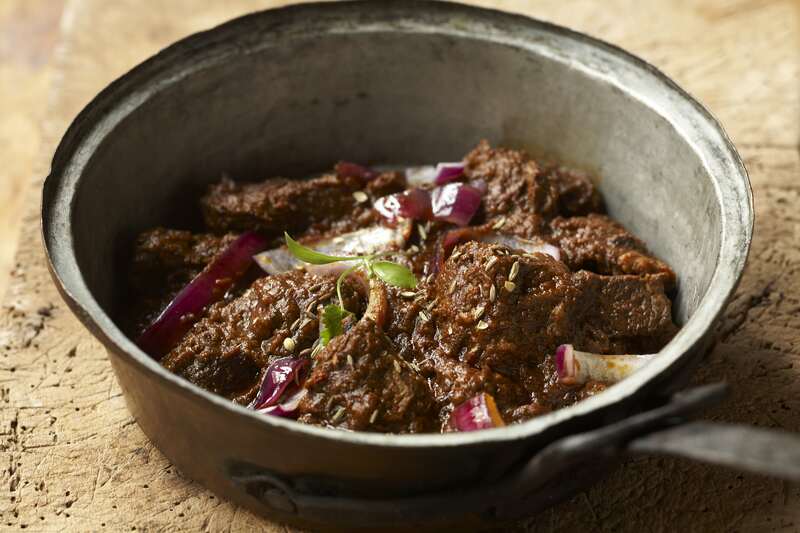 January’s dish of the month features the recipe for a rich, winter-warming Beef Bhuna. Bhuna is a term you commonly find on restaurant menus. It refers to cooking meat with spices with little or no water added. This requires constant stirring to prevent the spices sticking to the bottom of the pan but the resulting dish is rich and intense in flavour from the caramelisation of the onions and the frying of the spices. I’ve made things easier here by adding a little water but do make sure that all or most of it dries up so there is no loss of flavour. Mix together all the ingredients for the marinade. Add the beef, turning to coat it well, and set aside for 30 minutes. Heat the ghee in a large, heavy based pan, add the whole spices and bay leaves and let them splutter. Add the marinated meat and stir well over a high heat, until the juices are absorbed and the meat begins to brown. Add the green chillies and water, then reduce the heat, cover and cook gently for 25-30 minutes, until the beef is about two-thirds done. Add the tomatoes and ginger and cook for 8-10 minutes over a high heat, stirring all the time to mash up the tomatoes. You may have to add a couple of tablespoons of water to prevent the sauce sticking to the bottom of the pan. When fat begins to leave the side of the pan, the meat has reached the bhuna stage. Now stir in the tamarind paste and lemon juice, followed by the chopped coriander. Finally add the pinch of sugar, then cover the pan and switch off the heat. Leave for about 5 minutes so the meat can complete the cooking in its own heat. Serve with layered parathas. December’s dish of the month features the recipe for a home-style chicken curry, or ‘ishtu’. This is served in Syrian-Christian households in Kerala for breakfast and is a firm favourite at the Christmas table. You use boned chicken in this recipe if you wish, but chicken on the bone provides much more flavour. If using boned chicken, use just the thighs and cook them slow and long for a great result and depth of flavour. As made by Vivek on BBC’s Christmas Kitchen. Catch up on the show here. Happy holidays! For the chicken stew, heat the oil in a large, lidded frying pan or sauté pan. Add the cinnamon, cloves and cardamom, followed by the garlic, ginger, onions, chillies and curry leaves. Cook over medium heat until the onions are soft. Add the chicken, salt and pepper and stir for a minute. Pour in the coconut milk and 125ml/4fl oz water. Reduce the heat to low and simmer, covered, for 45 minutes, or until the chicken is cooked through. Meanwhile, soak the rice in cold water for 20 minutes, then drain well. Heat the oil in a large, lidded saucepan. 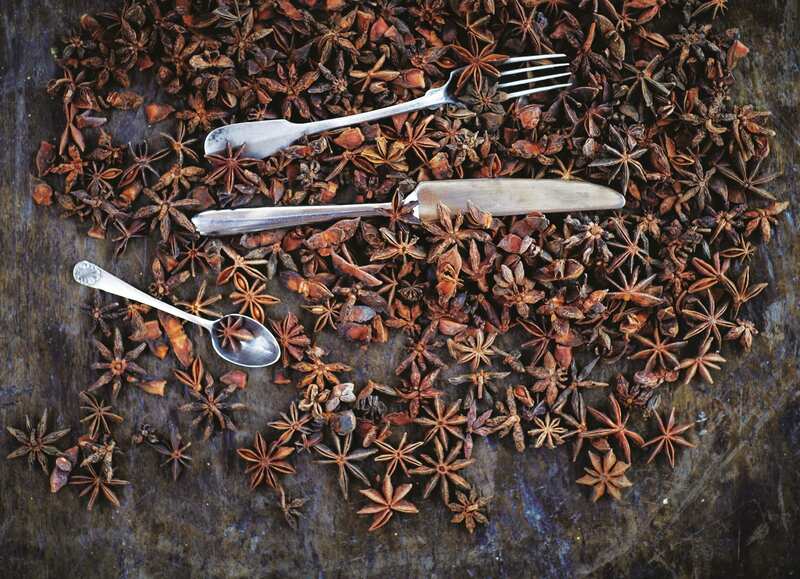 Add the star anise, cardamom and bay and cook, stirring, for 30 seconds. Add the onion, curry leaves, salt and sugar and cook until the onion is soft and translucent. Add the vinegar, coconut milk, 300ml/10fl oz water and then the rice. Mix well, then simmer, stirring, for 5 minutes. Reduce the heat to medium, cover with a tight-fitting lid and cook for 7–8 minutes. All the liquid should be absorbed. Take off the heat and stir. Cover with the lid again and set aside for 10 minutes to let the rice finish cooking in its steam. To serve, add the vinegar to the stew, sprinkle over the garam masala and mix well. Remove from the heat and serve with the sweet and sour rice. 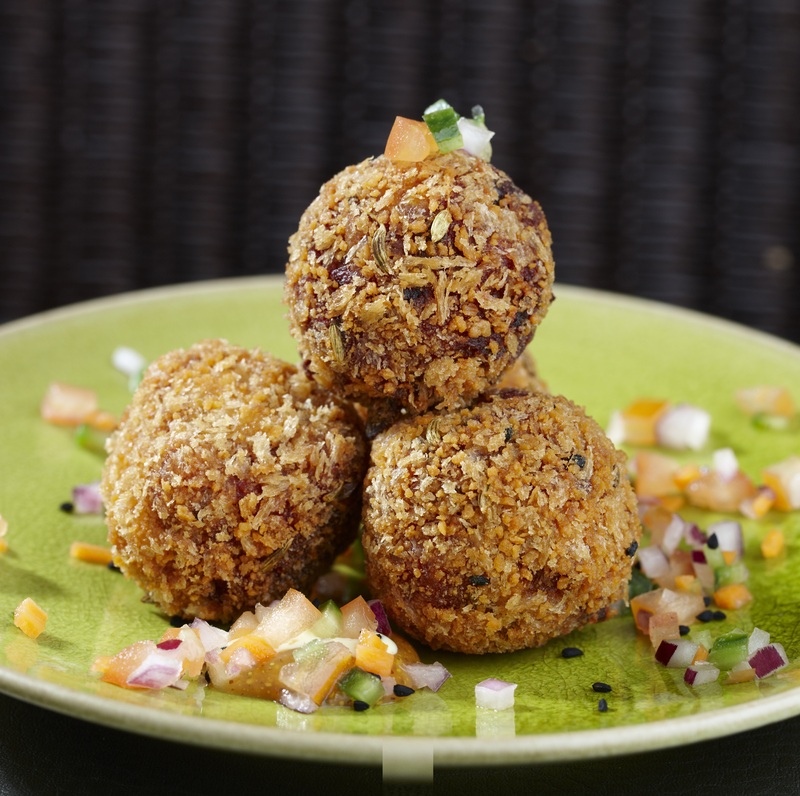 As we head into the festive season, I’m sharing my recipe for Bengali crab and cod cakes. This is a great little snack, and an ideal dish for a party, it can be useful to use up all the trimmings, if you had a big party. The crab cakes are slightly unusual in its use of raisins, but I have several good memories of having these as a child, this was our neighbour’s way of getting us to like fish as children! Clean the cod fillet, remove the skin and cut into 4-5 even-sized pieces. Place them on a pan and add a couple of tablespoons of water. Add salt and turmeric and lightly poach on medium heat with the lid on, for about 5-6 minutes, till the fish pieces are cooked. Remove and pat them dry on a kitchen paper. Gently flake them using a fork and set aside. Reserve the liquid and reduce to get a concentrate. To make the spice mix, roast all the ingredients and blend them together to a powder in a food processor. To make the fish cakes, heat the oil in a large frying pan. Add the bay leaves and cumin seeds and when they release their flavour, add the onion and sauté till they become golden brown. Add the ginger and garlic pastes followed by the turmeric and chilli powder and crab meat, sauté for a minute. Now add the fish, ginger, green chillies and the mashed beetroot and stir gently to mix them with the spices. Add the reserved cooking liquid. Sprinkle the spice mix powder, add the raisins and coriander and mix well. Remove and leave to cool. Divide the mixture into 8 portions and shape into balls. Dust them with the flour, dip in the beaten eggs and roll them in the breadcrumbs until thoroughly coated. Flatten slightly and deep fry in a deep-fat fryer or a deep saucepan for 2 minutes, until golden brown. Drain on kitchen paper and serve straight away. Serve with salad and mustard mayonnaise. October’s dish of the month features the recipe for kheema stuffed parathas, a popular Punjabi breakfast. Dip the bread into yoghurt or pickle or scoop up butter with it. Traditionally it’s always freshly churned home made butter but regular salted butter will do just fine. As made by Vivek on BBC’s Saturday Kitchen – catch up on the show here! 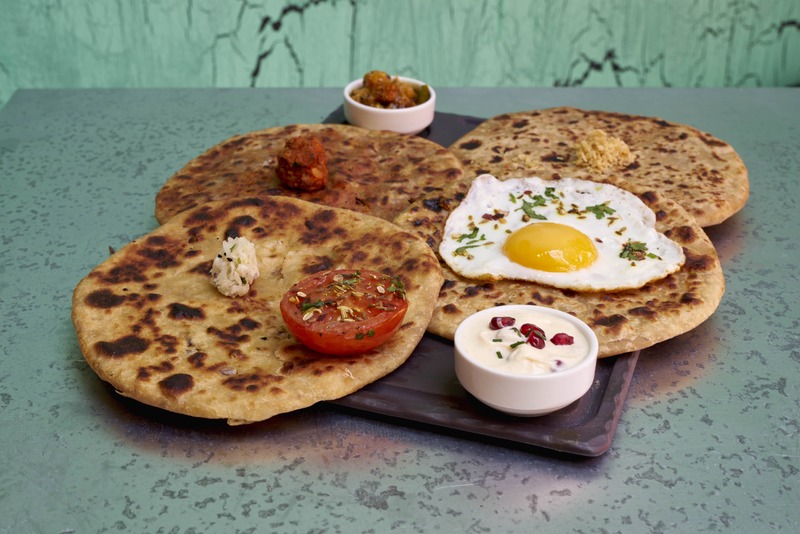 Discover our new breakfast menu at Cinnamon Soho where you will find these parathas, among many other flavours and more.. Mix together the flour, carom seeds, salt, oil and 225ml water to make a smooth dough. Cover and rest for 15 minutes. Meanwhile, make filling. Heat the oil in a pan to smoking point and add the whole spices, followed by the cumin seeds. When they start to crackle, add the onions and cook on medium-low heat for 2-3 minutes. Add the ginger and garlic paste, salt, the ground spices, chopped ginger, green chillies and stir for 2-3 minutes to cook out the spices. Now add the minced lamb and cook until dry and liquid has evaporated. Add the grated boiled potato and cook for a minute stirring to mix thoroughly. Adjust the seasoning and sprinkle with the chopped coriander, green chillies and the lemon juice. Remove from the heat and let the mince filling cool down completely. Pick and discard the whole spices, then divide the stuffing into 10 equal portions and roll into balls. Use to fill the paratha. Take a ball of dough, make an indent and keep pressing and rotating the dough in your hand to make the cavity slightly larger than the size of the ball of stuffing. The edges of the cavity of dough should be slightly thinner than the rest of it. Sit the ball of filling in the cavity and bring together the edges to cover the stuffing from all sides. Do not leave any cracks or the filling will come out while rolling the parathas. Lightly dust with flour, gently flatten then roll out into a 20cm in diameter disc. Place a rolled paratha in a heavy-bottomed frying pan, preferably iron, over a medium-low heat. Cook for about 2-3 minutes on one side, then flip over and repeat on the other side. As it cooks, roll out the next paratha. When both sides become dry and start to colour, brush with a little ghee to get even colouring. Remove from the heat and keep on a foil-lined plate. Keep the pile of parathas warm by loosely wrapping in foil. To make the raita, cut the pomegranate into two halves and remove the seeds by gently tapping with a rolling pin or back of a heavy knife. Reserve a few grains of pomegranate for garnishing. Combine all the ingredients except the coriander leaves and mix well. Transfer the raita into bowls, sprinkle the coriander on top and refrigerate until use. Serve the parathas with the pomegranate raita. Alternatively, they can also be served with cold salted butter. At The Cinnamon Club this month we are delighted to be paying a tribute to Roald Dahl. 2016 marks 100 years since the birth of Roald Dahl – the world’s number one storyteller, and so we have a special Dahl Menu running all month! Find out more here. I’m sharing with you India’s every day dahl, compared to black lentils, which is more for special occasions and tends to be cooked in restaurants rather than home. In most households the lentils would be served quite thin and watery, simply boiled and tempered with spices. 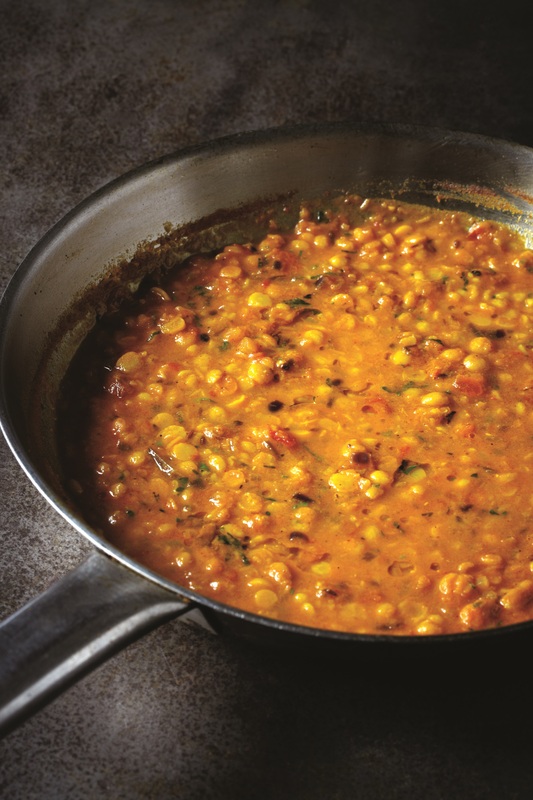 The process of adding spices crackling in hot fat to cooked dahl is commonly known as tadka, hence the name of the dish. The flavours and spices vary from region to region. In Rajasthan, they would simply use asafoetida, cumin and chilli, in the Punjab garlic, onion and tomatoes are added, while in southern India it’s common to see lentils tempered with curry leaves, chillies and mustard seeds. The options and flavour combinations are endless. Wash the lentils in running cold water, and then drain well. Put them in a pan with the water, turmeric and salt, bring to the boil, then reduce heat and simmer for 3-40 minutes, until they are so thoroughly disintegrated that you cannot tell the different lentils apart. Remove from heat and set aside. Heat ghee in a heavy bottom pan; add the whole red chillies, asafoetida, and cumin seeds and allow then to crackle, add the garlic wait and for it to turn golden brown, add the onions and sauté over moderate heat. Add the red chilli powder, sauté for a minute or two. Add the tomato and cook for 5-6 minutes over moderate heat and throw in ginger, green chillies coriander leaves and pour the mix over the lentils. Adjust the seasoning and finish with lemon juice. Tip: In some parts of the country, as many as 5 different types of lentils are used. You could use as many different types as you could find, just make sure that most of them have their husk removed as otherwise it changes the colour of the final dish.